Namibia is Acacia-country: These ubiquitous plants live in the dry savanna, along the water arteries of the valleys and on hillsides. Acacias are a main constituent of the typical bushveld of central Namibia. A.erioloba (Camel thorn) with its typical big grey boat shaped pods is found all over Namibia from the south-western border of the Namib to the North of the Etosha pan. The tree can get very old – up to 1.000 years. It is the Majestic Tree among the acacias. A very close relative is Acacia haematoxylon. It features smaller silvery leaves. Thereby it is called Grey camel thorn. It is only found in the South-Eastern part of Namibia.The highland around the capital Windhoek is home to A. hebeclada (Candle thorn), easily recognised by the big pods that stand erect from the twigs. Shorter prickles are strongly recurved, while larger spines are mostly straight with only the tips recurved. 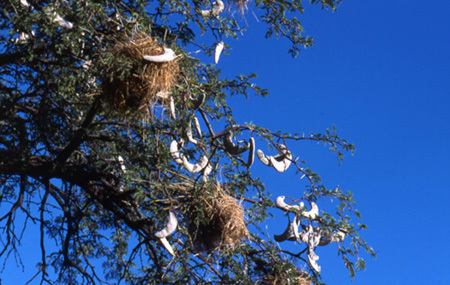 From the north a variation with hanging pods - Acacia hebeclada ssp. tristis - is described. The widespread Acacia karroo (Sweet thorn) features long white spines in pairs, small leaves and the beautiful bright yellow clusters of flower heads. The European traveller will be reminded of the Mimosa trees in Mediterranean countries. No wonder: Acacias belong to the Mimosaceae subfamily. Pods are sickle shaped or linear and come in various sizes. A.nilotica (Scented thorn) is looking quite similar to A. karroo regarding thorns, flowers or bark. It is best distinguish by the pods. In A.nilotica there are marked constrictions between the seeds. The green pod resembles fresh pees. It is more difficult to distinguish between A. lüderitzii (Belly thorn) and A.reficiens . Both can show long spines as well as short hooks or prickles, white flowers and a reddish bark. The less water there is available, the more A.reficiens tends to prevail. It has less and smaller leaves and grows less high. Small branchlets are finely velvety without long hairs. In contrast to A. lüderitzii, where leaflet margins are fringed with fine hairs, leaflets of A. reficiens have no or only little hairs. This difference can be detected with a strong magnifying glass. prickles. But most distinctive is the shape of the pods: They are twisted into a tight circle or into a helix like a coil spring, giving rise to the german name: Ringelhülsen-Akazie. Some Acacias call Namibia home: These are the endemic species found in the dry west, the Damaraland and the Kaokoveld. The Brandberg Nature reserve is home to the A. Montis usti (Brandberg thorn) with the looks of a reversed broom. Further north, A.robynsinia (Whip-stick thorn) sends slender branches from a small thicket on the ground into the air like an antenna, leading to the common English name Radio-tree. And even further north in the Kaokofeld lives A. arenaria (Sand thorn), a many stemmed shrub up to a height of about 3m. It has white or pale pink flower heads and a rather sparse foliage. In the more humid micro-habitat of the Waterberg in Northeastern Namibia grows A. ataxacantha (Flame thorn). It has its prickles scattered along the stem and the branches like a rose. 5 x 6m wide thickets of this climbing species are found. Its long white flowers cover the whole plant in spring-bloom. One of the most common species is A.mellifera (Black thorn). It is easily recognised: Each pinna consists only of one pair of large leaflets. Farmers do not like it, because A. mellifera penetrates all open spaces, forming thickets. The numerous sharp hooks make those impenetrable. It is quite difficult to differentiate between A.erubescens (Blue thorn) and A.fleckii (Plate thorn). Many small leaflets per pinna distinguish A.fleckii from A. erubescens. Other indicators for A.fleckii are the bigger flower spikes, a rougher bark and a later blooming time. The latter, however, is very much dependent on regional rainfalls. A.fleckii blooms after the leaves have developed, while A. erubescens starts its bloom before the leaves appear. The rachis of A. fleckii sometimes is armed on the underside with a series of prickles that you can easily feel with your finger. There is also occasionally a third thorn on the upper side of the stem, located between the usual pairs and in some instances a row of two or three hooked prickles which are internodal and are located immediately below a normal pair. A. erubescens is widespread in Northern Namibia. The name refers to the yellow papery layers of bark that peel off – like in a birch – showing brighter white layers below. During the midday heat, when the Acacias fold their leaves to reduce contact with the sunlight, the leaves appear from some distance like the hanging flower stalks of a blooming birch. There are a lot of similarities between the two species just mentioned with A.hereroensis (Mountain thorn): Leaflets are small and numerous, small dark hooks come in pairs and the flower is a white spike. A marked difference to the light coloured bark of A. erubescens and A.fleckii is, however, the brownish-grey bark which is coarsely longitudinally fissured. As the English name suggests, it prefers high ground and is common to the west of Windhoek. It is again the pods that charcterise A. nebrownii (Water thorn). The multi-stemmed shrub forms thorny thickets, features the common yellow flower head and has mostly one pair of pinnae – rarely two. The small pod is covered with superficial glands. The gum of several acacias like e.g. A.karroo (Sweet thorn!) and A.senegal (Three-hook thorn) can be chewed like sweets. The polysaccaride exudate from A. senegal is used as a food additive e.g. to fix flavours, as an emulsifier, foam stabiliser or clouding agent for beer. For that purpose, A. senegal is cultivated in West Africa. The species A. senegal var. rostrata is also common in Namibia. It is mainly recognised by the triple black hook thorns and the whitish new growth of the twigs. Also the shape of the pods – quite flat and broad – is typical. Two decorative species, which do not occur naturally in Namibia, are often found in gardens: A. xanthophloea (Fever tree), is a striking – often tall - tree with a powdery light yellow-green bark. A. galpinii (Black monkey thorn) has strong black hooks like the claws of a monkey. Its decorative leaves and the flaky light-coloured bark make it interesting for gardens. In older books Faidherbia Albida (Ana tree) is still classified as A. albida. It is a rather quickly growing tree and can reach impressive sizes. It grows in riverbeds in the North-west. Pods are bright orange to reddish brown, conspicuously curled into a circular coil or variously twisted (“Apfelschalen-Akazie”). They are sought after by wild animals – like the desert elephant - as well as by livestock. Most species of the Acacia family occur in Australia. They have mostly no thorns and are called wattles. There is a beautiful relative in Namibia, that also belongs to the Leguminosae with its leaves resembling Acacias, the African wattle: Peltophorum africanum. It is found in the Northern parts of Namibia, where the bright yellow flowers colour the mountainside. One remark at the end for the European readers: Acacias are occurring naturally in all continents except Europe and Antartica. The trees that are often referred to as Acacias in Europe are in fact Robinias (Robinia pseudoacacia). As long as they are the source of the delicious acacia-honey, we should overlook this mistake. No specific guide on Namibian acacias exists. In 2005 a tree atlas of Namibia has been published by the National Botanical Research Institute, featuring 28 Acacia species plus A. albida.